The debate around global warming was revived this week when formerly sceptical climate scientist, Richard Muller, confirmed in his recent study from the Berkeley Earth Project that global warming is caused by human activity. But increased carbon dioxide (CO2) emissions from our use of fossil fuels have another serious consequence. Meet ocean acidification, the other CO2 problem. Ocean acidification is a much lesser known result of the millions of tons of CO2 released daily into the atmosphere. It does not have a direct impact on the climate, because it does not affect the weather patterns, but it can interact with it. Around 30% of the CO2 released into the atmosphere since the industrial revolution has been absorbed by the oceans. Had the oceans not absorbed this carbon dioxide, the CO2 concentration in the atmosphere would have been much higher and the global warming problem far worse today. However, this CO2 absorption has other impacts which have only begun to be understood in the last decade. When carbon dioxide dissolves in seawater, it interferes with the carbon cycle, changing the proportion of carbonates available to calcifying (shell-forming) organisms and reducing the seawater pH. According to the IPCC models, the ocean pH will be 7.8 by the end of this century, 0.5 units below the pre-industrial level, a level that has not been experienced in millions of years. This acidification is happening 100 times faster than has been observed in our geological past. This rapid acidification will have dramatic and irreversible impacts on marine ecosystems. 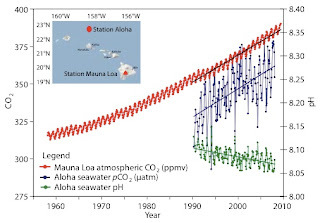 There is no time to debate ocean acidification, as it is happening and is measurable today, as seen by the data collection of stations such as the Mauna Loa NOAA Observatory, in Hawaii. This seawater chemistry change affects marine organisms in ways scientists are only realising now. Not only it can be difficult for plankton and shellfish to build their shells, but it affects other organisms’ features such as fish’s ability to smell. 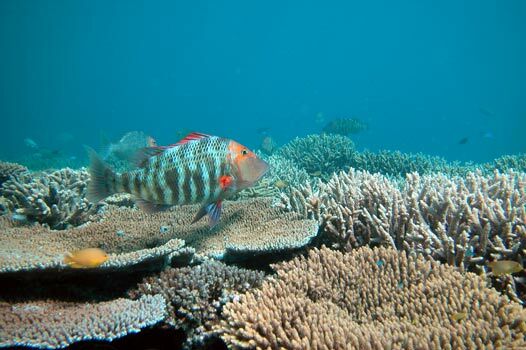 Some of the most fragile ecosystems, like coral reefs are at even higher risk. The awareness of the general public is starting to increase, thanks to the tremendous work of the scientific community. For instance, the outcome document of Rio+20, “The future we want”, mentions this challenge. But, as Natassia Ciuriak says in a recent article in the Paterson Review of International Affairs, if the ocean acidification problem is not quickly addressed by the political community, countries can face serious economic consequences with loss of ecosystems and effects in fisheries, among others.